TRUCKOMAT was founded in 1969 and over the years has grown from 1 to 8 locations. 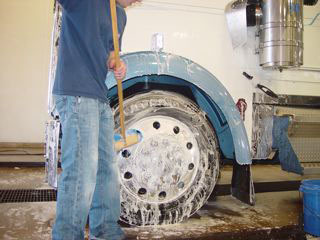 TRUCKOMAT truck washes are conveniently located throughout the Midwest and eventually we will be expanding to other regions of the United States. All locations are open 24 hours – 7 days a week. It all started when trucking was just a gleam in some of today’s drivers’ eyes and Interstate 80 was not yet completed, the Iowa 80 Truckstop was founded. In 1964, Standard Oil built and opened the truck stop, and in September 1965, Bill Moon took over management of the truckstop for Amoco. Like many of the truckstops in existence at the time, Iowa 80 was a small facility that only took up a fraction of what it does today, housing a small truckers store, one lube bay and a restaurant run by the Peel family. Under Mr. Moon’s keen management, the truckstop began to grow and in 1984 Bill Moon purchased the truckstop from Amoco, that like the industry itself, has been a flurry of activity and expansion ever since. Now that it was theirs, the Moon family was able to remodel, update and expand the restaurant and truckers store. This was the start of what the Moon Family wanted to provide for drivers; satisfaction. With that concept, TRUCKOMAT was founded and has grown since 1969. Iowa 80 Group owns Iowa 80 TA Truckstop, Walcott, Iowa; Joplin Petro, Joplin, Missouri; Oak Grove 70 Petro, Oak Grove, Missouri; Kenly 95 Petro, Kenly, North Carolina; Effingham Chrome Shop, Effingham, Illinois; Truckomats in Little Rock, Arkansas; Indianapolis, Indiana; Walcott, Iowa; Joplin, Missouri; Oak Grove, Missouri; Kenly, North Carolina; Hebron, Ohio; Oklahoma City, Oklahoma; as well as, CAT Scale Company; IOWA80.COM mail-order catalog and e-commerce web site and Iowa 80 Trucking Museum, Walcott, Iowa. The Iowa 80 Group provides quality products and exceptional services at fair prices to the professional truck driver and the general public. We will make all of our locations places where people want to stop. We will maintain the highest standards of cleanliness, appearance, safety and Fast, Friendly and Competent service. We will provide pleasant and unique places to refuel, refresh and relax – where customers will receive more than they expect with enthusiasm from our TEAM. We will make trucker satisfaction our #1 priority. We will continue to make our locations appropriate places for families. We will be a place where people want to work. We will provide fair and ethical treatment of employees, enthusiastic leadership, recognition, advancement, fair compensation, competitive benefits, a safe work place and employee development.